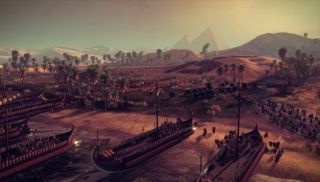 Creative Assembly's Al Bickham and Joey Williams gather up their elephants in an attempt to show you how to tackle Total War: Rome II's historical Battle of the Nile scenario. Watch on to learn how best to organise your units into a suicidal charge up a heavily defended hill. Or, if you're me, how to then wait patiently and subtly alter plans without resorting to ramping up the unit speed and letting the whole thing descend into slapstick chaos. Total War: Rome II is due out September 3rd.